The Quick Action Closing Fund (QACF) is a targeted economic development incentive program the state of Arkansas uses to try to increase economic activity. This program allows the state government to give cash grants to attract or retain businesses. It’s largely up to the Governor of Arkansas to approve these cash grants. 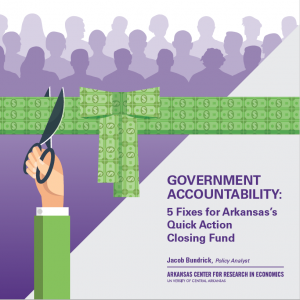 Arkansas lawmakers can take steps to improve the transparency and accountability of the program. 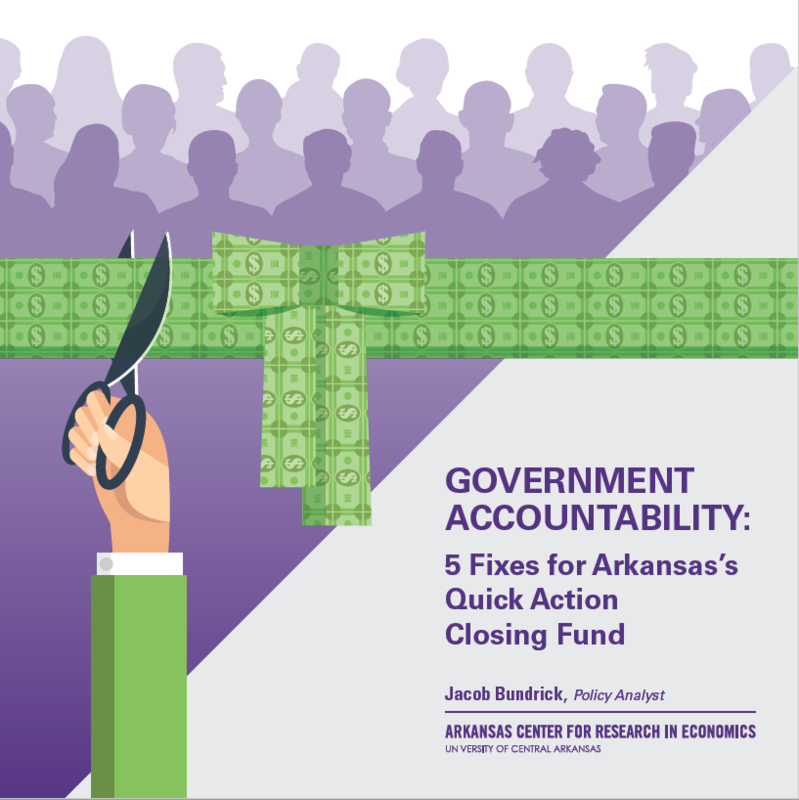 Government Accountability: 5 Fixes for Arkansas’s Quick Action Closing Fund, a policy review written by ACRE Policy Analyst Jacob Bundrick released in November, 2018, looks at five different policy proposals that could accomplish these goals. Where does your county rank in terms of transparency? Find out in ACRE’s Transparency Index released in September, 2018. This inaugural index produced by ACRE Policy Analyst Mavuto Kalulu and Program Coordinator Terra Aquia ranks all Arkansas counties by how much financial, political and administrative information their websites contain. 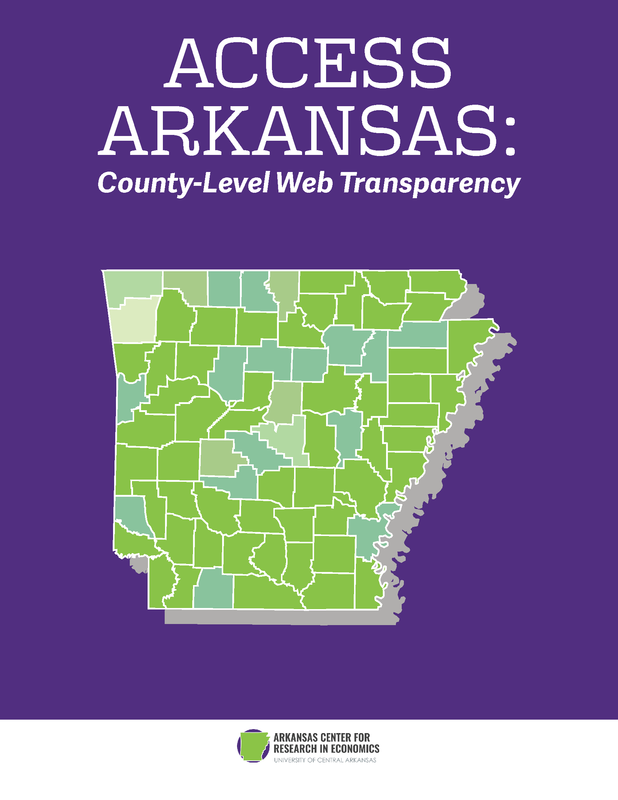 Arkansas counties earned an F grade in the 2013 Transparency Report Card produced by the Sunshine Review. Kalulu and Aquia hope the index will motivate Arkansas counties to improve access to this important information for their constituents. What can Arkansans learn from other states’ tax reforms? 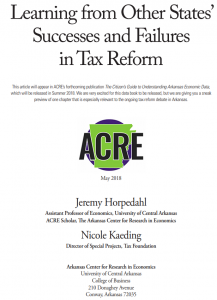 Horpedahl and Kaeding show that there are important lessons for Arkansas legislators to learn from other states and principalities when considering how to proceed on tax reform. Utah, Indiana, North Carolina and the District of Columbia implemented “smart, sensible” tax reform measures that can “dramatically improve competitiveness.” While the authors list multiple examples Arkansas should emulate, they also tell a cautionary tale about the “haphazard” tax reform efforts in Kansas. 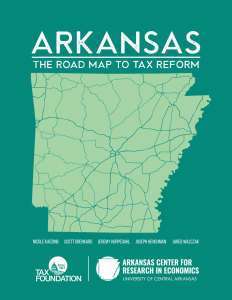 ACRE completed a year-long study of Arkansas’s current tax system, its history, and suggestions for tax reform, and the results of this research were published in our report “Arkansas: The Road Map To Tax Reform” in 2016. This is a joint publication with experts at the Tax Foundation in Washington, DC. 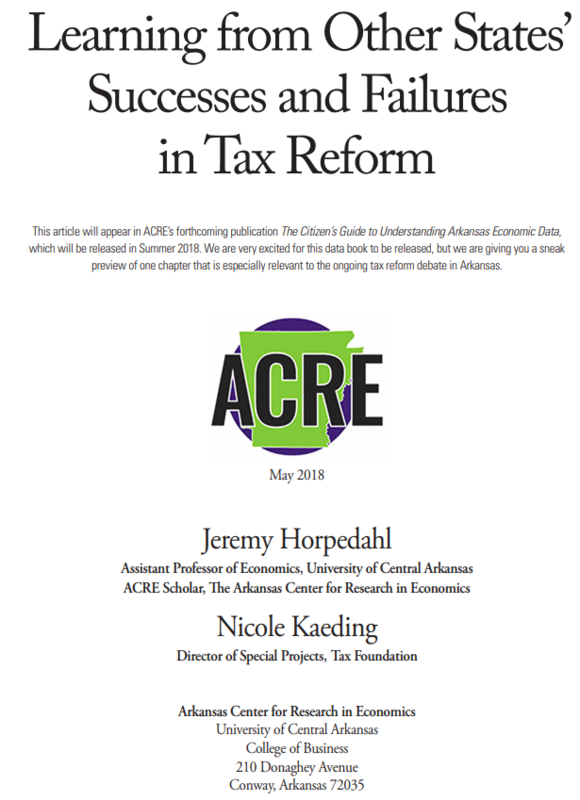 For more of ACRE’s work on taxation, please see our “Taxation” issue page. The Arkansas Center for Research in Economics (ACRE) is an Arkansas focused research center housed in the College of Business at the University of Central Arkansas. ACRE scholars and policy analysts use academic research and original analysis to educate the public on important issues of public policy in Arkansas. Our research focuses on barriers to employment, taxes and subsidies, K-12 education, property rights, and government transparency. ACRE promotes solutions that respect the personal and economic freedoms of individuals because protecting and expanding these freedoms has a proven record of improving the lives of people around the world and here at home.